Yeah, Alte Cocker went to Edirne. You may know it as Adrianople--or you might not know it at all. On the corner right on the Bulgarian and Greek borders in Turkey, it has gone back and forth between Greece and Turkey with attendant population disruptions. For those who don't know, the Greeks and Turks--despite much common history--ain't great pals. When I do a home exchange, I am quite rigorous about staying in the home for which I have exchanged. I do not try and see the entire country, checking off all the major sites in the guidebooks. If I do that, after all, the trip will cost a lot of money and moot the point of a home exchange. I had already been to Cappadocia on this trip. I went back and forth about doing another side trip and ultimately spring for it. Most people would have gone to Ephesus or Gallipoli, but Alte Cocker being Alte Cocker, I did something else. Before going to any foreign country, I do a lot of reading. I became fascinated by Mimar Sinan. The Turks regard him as the greatest architect who ever lived, and he may be. He certainly was responsible for a lot of mosques and his masterpiece is considered the the Selimiye Camii ("camii" being the word for "mosque" in Turkish). Edirne is only 2 hours by bus from Istanbul. Gallipoli and Ephesus were a lot farther, so I decided to go to Edirne on the grounds that it was the easiest. Unlike package tours where everything is arranged, independent travel usually devolves into a series of misadventures along the way. Staying in Cevizli--a far Asian suburb of Istanbul (near Kartal for the map obsessed)--I am sure there was an easier intercity bus to take than one from Istanbul, but the main Istanbul terminal was the one I knew so I used that one. Buses are the main system of intercity transportation in Turkey--and they are very good. In fact there is even a steward on the bus who gives you bottled water and snacks. OK, I get to the bus terminal and find I the right place to buy the ticket. I am then asked for my passport. Duh. I thought I had left it at home and was going to have to go the following day after retrieving it. Fortunately, it turned up in my bag and off I went. I think I have mentioned that Turkish streets often have no names. Every time I got in a taxi, I had another unwanted adventure. It wasn't the old "drive the tourist around in circles running up the fare" gambit. If the taxi driver was outside the immediate area of his assigned stand, he had no clue--another reason not to drive in Turkey besides the aggressive driving and potholed roads--if you don't know what you are doing. Similarly, an ignorant tourist dumped in a one horse town like Edirne was bound to get lost. What I wanted was the street with the small hotels. No one could tell me how to get there. I pulled out a map. No one could show me where I was on the map. Sure, they knew where everything was, but there were no directions that said, "Turn right/left on such and such street." I was in the Old City. No signs. Finally a policeman who spoke some English took pity on me (sometimes being a confused Alte Cocker has its advantages) and took me to the street. Predictably, it the street was around the corner, but who knew where the corner was? Ah, the great sigh of relief. The Hotel Tuna had a room and I could go and eat dinner in peace at a restaurant across the street. The next day I went to see the Selimiye Camii. To tell the truth, I was a bit disappointed. 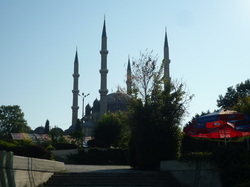 Before visiting Edirne, I had seen a lot of mosques--with mosques Turkey is like churches in Italy. I had been mosques out. Perhaps if I had seen it at the beginning of the trip. It was pleasant being in a relatively laid back town where the whole town came out to the Old City in the evening. Unlike my neighborhood in Istanbul where the end of the Ramadan fast was announced by the mosque in an announcement, in Edirne there was a cannon shot--just like the old days. That, by itself was worth the price of admission. People sat waiting to eat until the cannon shot and then the partying began. On the second day in Edirne (I stayed 2 nights), I to a couple of more mosques and a Medical Museum on the outskirts of Edirne. I found the museum fascinating. During the Middle Ages Europeans were burning the mentally ill as witches. The Turks were treating them with music. In fact, for a period of time, Turkey was much more advanced than the West. I spent a half a day in the museum. It was apparent--given the number of tour buses--that it was a major tourist destination for Turkish tour groups. I don't think I met any other foreigners when I was there. No, Alte Cocker did not cross the Greek or Bulgarian border to check off more countries on the list. She took the bus back to Istanbul and the traffic. Minor casualties of the trip: One hiking pole left in a taxi to the Medical Museum and one nightgown left in the wardrobe at the Hotel Tuna. I did not try to retrieve them. Since both were cheap crap, no great loss. Such is travel when you are an Alte Cocker--or maybe when you are not.